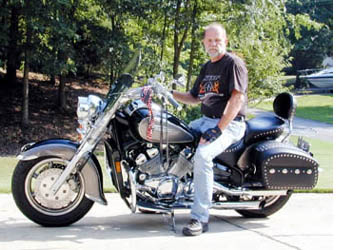 Daniel Harris - "Royal Star Dan"
Dan Harris (RoyalStarDan of Alabama) says: "Silver Back is a '97 Royal Star Tour Classic, black on gray, with Cobra pipes, Bigfoot all the way, D3K, Yammy Corbin seat, newly installed short windscreen and passing lights. This bike is one of those orphan bikes sold on E-bay, but love was at first sight. I knew I had to have this one even if no one else bid on her. I bought at bottom bid and was proud to to give here a home she needed, even if I had to fly from Alabama to Las Vegas and ride her home in mid December!! Had 12.4k on the speedo and now has 24k on it, trying my best to catch Glenn, but that is a long way off."